Ontario residents have been kept in the dark, but Canada’s most populous province is about to become an unlikely and international battleground. After all, how many times does the Great White North threaten the drinking water of more than 40 million people, including their neighbours in America? Legislators from south of the border have already taken issue with plans for a deep geologic repository. Less than a mile from the shores of Lake Huron, Bruce Power intends to store 200,000 cubic meters of nuclear waste within the natural rock formation. Senators and congressmen shared their dissent with the Canadian government, but the fed responded by sending police to the homes of eco protesters, in what some would call an act of intimidation. It will take at least 300 years for the nuclear waste to decay, to a point that radioactive catastrophes are not a threat to human populations. This Kincardine, Ontario location was also chosen for its low seismic activity, reducing the likelihood of water and soil contamination by earthquake. This much we’ve always known, due to the federal environment assessment that required public consultation. The Harper government has since levied time restrictions to speed the process along, but this is one project that was too big and too perilous to keep from the radar at all. Seemingly unrelated, the controversy over fracking and in-situ technologies to harvest oil has been raging around the world. Ohio experts claim it causes earthquakes. Texans say it releases benzene and hydrogen sulfide in the air, causing everything from cancer to nosebleeds and skin rashes. British scientists say it causes radioactive contamination. 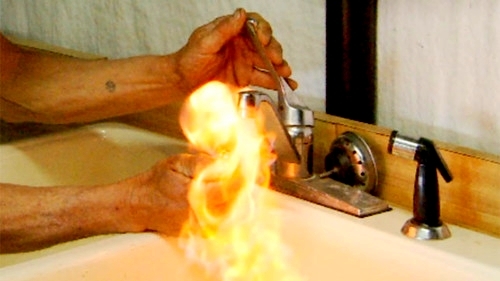 Researchers at Duke University say it makes water flammable in Pennsylvania and New York, where investigators cite enough contamination to blow up homes with families in them. In Canada, the Idle No More movement continuously defends First Nations from plans to frack their tribal territory and there’s still the argument of numerous toxic chemicals used in the extraction process. The topic of hydraulic fracturing is so polarizing that countless provinces, states and cities have sought a moratorium. The mayor of New York City added his voice to the opposition, with strong reservations about the impact to water safety. By contrast and north of this shared water source, scientists from Canada were abruptly silenced by the federal government and environmental laws were gutted, so there is no mechanism or freedom to complain above the forty-ninth parallel any longer. This much we also knew, but how could it possibly relate to a nuclear waste dump? Critics warned that sweeping changes to de-monitor water, curtail public input and failure to assess smaller power projects would have a grave and lasting impact on the Canadian ecosystem. They denounced newly legislated secrecy and threw their hands in the air when the government conducted a good old-fashioned, scientific book burning. They went so far as to accuse the Harper administration of oppressing Canadians for the sake of Alberta oil profits, meant to benefit the Prime Minister’s friends at a cost to every other industry in the country. With few studies or consultations required anymore, the public wouldn’t be privy to projects that conflict with each other either. It was a Nostradamus moment that wouldn’t take a thousand years to come true. It’s just that our first example arises in Ontario, further east than they predicted when pitted against bitumen, LNG or coastal pipelines as the likely candidates. When people think about oil, they don’t naturally imagine the Great Lakes region as an epicenter for this development. No one can blame residents for being remiss, when information became inaccessible to the public and for that matter to Americans who are impacted by Canadian activity. Former Ontario Premier Dalton McGuinty claimed there would be no fracking until the province studied evidence to determine if the practice was safe. The new premier has never commented and no elected officials have alluded to anything different. With all this government subterfuge from provincial and federal levels, the only way to learn about energy projects is through private company investor reports and knowing which ones to research now. Bruce Power, meet Dundee Energy Limited. The former is an Ontario nuclear giant and the latter has the largest stake in Ontario oil. The two may operate side by side, but you’d never know from asking any level of government including municipal managers. These companies also favour the same rock formation, but for very different reasons. Nuclear proponents believe the shale is strong enough to store radioactive waste, while oil competitors have chosen the area due to rich deposits and the porous nature of the same rock, making it a perfect specimen for fracking. It’s hard to see how both could be correct, but everyone drinking water along the Great Lakes is in the crosshairs of this corporate aggression. From Neil Young to Yoko Ono, concerned stars have raised alarm bells regarding each of these topics, but no one thought to consider the impact of running these operations together. Fracking beside nuclear waste is a new concept for sure. The consequence of either practice is still a new frontier and combining them won’t be studied in Canada, nor will anyone be informed to care. This situation is complicated by a few key players. Nuclear behemoth Bruce Power is technically owned by TransCanada Corp, that is better known for the KeystoneXL oil pipeline and tribulations visiting the White House. It’s also owned by Cameco, recently accused of tax evasion related to uranium sales. This partnership is completed by the retirement funds of municipal employees and the Power Workers Union, otherwise known as an affiliate of the left-wing labour movement and CUPE. As these strange bedfellows negotiate long term destruction of the environment for short term gain, the public is none the wiser because every brand of elected official appears to have taken a vow of silence. In the case of Dundee Energy, it’s a subsidiary of the Dundee Corporation and federal Labour Minister Kellie Leitch was implicated in an alleged conflict of interest with this very consortium. While sitting on a board of directors for Dundee (REIT), Leitch was also debating legislation that impacted her environmentally averse tenants. In addition to meeting the needs of numerous oil clients under the Dundee real estate umbrella, this MP’s company position included an asset-based relationship with the National Energy Board (pgs 20-26). The National Energy Board is Canada’s environmental regulator and the body that oversees public consultation in a situation like the Bruce Power nuclear waste dump. It no longer needs to conduct environmental hearings related to Dundee’s oil pursuits, as a result of the Labour Minister and Conservative government’s plight to de-monitor water and “streamline” approvals. It’s now come to light that Leitch’s business associate was buying considerable land for oil extraction, with an eye for the riding she continues to represent. Dundee Energy also purchased junior speculators with rights to harvest oil in Ontario, around the same time she was named a trustee to the sister company with shared executives. For context, the Labour Minister’s family established the Fort McMurray oil sands town in Alberta, before her career was transferred to Ontario where the process may be repeating. This time brings us to Collingwood, Ontario and begins with thousands of acres around Blue Mountain that the oil industry took an interest in. This location boasts a farming heartland and world class ski resort, with waterside tourism in the summer. It’s unlikely Intrawest realizes the surrounding property is on the fracking horizon. It doesn’t bode well for stable snow formations if earthquakes are indeed caused by fracking. Yacht owners may pull their boats from oil-slicked waters and tourism around the protected Niagara Escarpment Biosphere may soon resemble the tar sands on this deregulated trajectory. The groundwaters sustaining agriculture in the bins at your local grocery store may also become poisonous if the experience of early adopters is any indication. To manage a complex and conflicting set of developments, here’s a recap to give clarity that illuminates who might have known what. 1857 – 1863: Canada’s first shale gas operation was founded in Collingwood, Ontario. It originally supplied the market in Toronto. This enterprise eventually failed due to competition from Lambton County and this local history would be forgotten, until the present day when it’s repeated. April 2008: Bruce Power begins drilling boreholes to test Collingwood, Blue Mountain, Georgian Bay and Manitoulin shales, in preparation for the nuclear waste deep geologic repository. A layout of the project is included, depicting the proximity to Lake Huron and a railway passing directly above the proposed radioactive location. September 2008: Mooncor begins aggressive acquisition of Ontario shale oil assets. They have access to 23,000 acres with the ability to develop Collingwood and Blue Mountain formations. November 2008: The Ontario Petroleum Institute holds an annual conference. Sponsors include Talisman and Torque Energy, as well as Enbridge, Haliburton and the US Energy Development Corp. Exhibitors include the Government of Newfoundland and the Ontario Ministry of Natural Resources. The latter presents “Shale Gas Opportunities in Ontario” during the session dedicated to fracking. The Ontario Power Generation also speaks about the Bruce Power waste site. That seminar is sandwiched between the effect of petrochemicals and how to fight back against eco protesters. February 2009: A Calgary based oil and gas consultant is hired to conduct seismic testing for the Ontario Bruce Power nuclear site. Data is borrowed from a nearby Texaco well and Shell oil pipeline. Many gas wells are noted in the area and previous studies failed to indicate a seismic fault line. With newer technology however, faults were discovered around the nuclear site and this information will be submitted to the National Energy Board. May 2009: The federal government finalizes a process of environmental review for the proposed Bruce Power nuclear waste site. November 2009: The Ontario Petroleum Institute holds an annual conference. Sponsors include Torque Energy, Talisman Energy and Enbridge. Shale gas opportunities are promoted in Ontario and the Minister of Natural Resources is a keynote speaker this year. Numerous reps from the Ontario government provide seminars as well as a report for oil companies, enticing hundreds of new explorations. The Collingwood and Blue Mountain deposits are given special attention, closest to the nuclear waste site. Health Canada is also an exhibitor. March 2010: Central Ontario oil was predominantly owned by Mooncor and Talisman Energy. The Dundee Corporation purchases “the largest accumulation of oil and natural gas assets in Ontario” for $131 million from Talisman, to overtake their interest in the area. May 2010: Kellie Leitch becomes a trustee at a Dundee company that oversees real estate. These portfolios include a considerable roster of oil companies and the National Energy Board. June 2010: Simcoe and Bruce Counties experience an uncharacteristic earthquake. The area surrounding a proposed nuclear waste dump and fracking locale, shakes enough to startle half the province awake. October 2010: The Ontario Petroleum Institute holds an annual conference. Sponsor information was withheld this year, but exhibitors include the Canadian Consulate General and various members of the Ontario government. Keynote speakers include disgraced Congressman Chris Lee (R-NY) and seminars are provided by the Ministry of Natural Resources, in addition to the Ministry of Northern Development. Dundee Energy updated their progress in purchasing Ontario shale assets, as the government updated its list of shale assets for promotion. Additional seminars were offered regarding hydraulic fracturing and the difficulty moving enough sand, water and chemicals to supply the fracking industry. April 2011: The Bruce Power nuclear site tests for the presence of gas. It’s found in the Collingwood, Blue Mountain and Georgian Bay formations, among others. Upon detailed analysis, the highest concentration of oil is noted in the Collingwood shale samples (closest to the nuclear repository), while the highest gas concentrations can be found in the Blue Mountain companion. This study and many more were submitted to the National Energy Board. April 2011: Mooncor creates spinoff company DRGN Resources to handle its Ontario shale oil and gas assets. The long term strategy includes overtaking smaller companies to become a major player in the province. May 2011: Kellie Leitch is elected Member of Parliament for Simcoe-Grey, after accusations of being parachuted from out of town. This riding consists of Collingwood, Blue Mountain and much of Georgian Bay. She still works with Dundee REIT and will not resign the executive position until the end of the next quarter, representing both the public and a corporation at the same time. June 2011: Dundee Energy Limited establishes 100 percent ownership of its Ontario oil assets, further retained by the Dundee conglomerate as the parent company. New horizontal wells are planned for extraction. June 2011: Several fish begin dying in Lake Simcoe. It’s part of the same glacial movement that created the Great Lakes system and it’s a 30 minute drive from the shores of Lake Huron. A magnificent amount of oil and gas tests are occurring at the same time (from government, the fracking and nuclear industries), but this is not considered a possible culprit because the public is unaware. August 2011: Dundee Energy purchases Torque Energy – a former sponsor of the Ontario Petroleum Institute and a remaining holdout competitor. Torque Energy includes oil assets in Ontario and the acquisition helps to pad Dundee’s dominant market share. September 2011: Mooncor retains a small amount of stock in Torque Energy, now owned by the Dundee corporation (pg. 12). At the end of this month, Member of Parliament Kellie Leitch resigns from her position with Dundee’s real estate branch as well. October 2011: The Ontario Petroleum Institute holds an annual conference. Sponsors include Dundee Energy, Torque Energy (under Dundee ownership) and Mooncor (with stock interest in Dundee). Keynote speakers include the Mayor of London and First Nations elders. Seminars are provided by the federal government’s Indian Oil and Gas Canada agency, the Ontario Ministry of Natural Resources and the Ontario Energy Board. Topics covered Aboriginal affairs and fracking, with a hydrofracturing demonstration to close the event. October 2011: Six thousand dead birds and fish scatter the shores of Wasaga Beach. It’s the longest freshwater beach in the entire world and lines much of Georgian Bay, connecting to Collingwood at Lake Huron. Both shale formations were being tested for oil and gas reserves, but botulism is the suspected culprit with little explanation regarding changes to the lake’s chemistry. The area never saw a die-off like this before and experts were left to guess a reason. November 2011: Mooncor engages the Dundee conglomerate for help to raise $5 million toward expansion. November 2011: An executive lawyer for Bruce Power and the nuclear waste site is appointed to the Ontario Centre of Excellence, to guide the provincial economy. This centre is funded by the Ontario government and Bruce Power continues to be owned by the same curious partners. May 2012: Thousands of dead fish appear on the shores of Lake Simcoe. The second time is worse than the first. The Ministry of Natural Resources waited a number of months before informing the public of a widespread infection and no detailed cause was ever given. September 2012: Dundee Energy invests $13.7 million in Ontario assets. Another $3.4 million is spent to acquire maps with seismic data, needed to plan the next harvesting sites. Inland extraction has become a priority to increase production, that offsets lower gas prices affected by greater American penetration and the Canadian petro dollar. A rig is purchased to assist with new drilling, allowing expansion in the Toronto gas market. In the process, they reserve $3.3 million for the Ontario Ministry of Natural Resources, in anticipation of future environmental costs. October 2012: The Ontario Petroleum Institute holds an annual conference. The sponsor list is excluded again, but the Ministry of Natural Resources, Conservative MPP Bob Bailey and a National Post editor were mentioned as speakers. Embattled Liberal Energy Minister Chris Bentley was invited to give the keynote address and topics narrowly focused on pipelines, fracking and promoting Ontario’s shale assets for exploration. November 2012: The Ontario government releases a comprehensive report (490 pages) meant to attract investment, reform applicable laws and assist corporations in negotiating with First Nations. Shale gas and oil in the Collingwood, Blue Mountain, Georgian Bay, Nottawasaga and Manitoulin areas is given special attention (pgs. 222-240), with specific mention of fuels (pgs. 275-286). Each is promoted as having the best potential for fracking related extraction. At least 360 samples were tested from wells and new boreholes in the years preceding, as part of the larger “shale gas assessment project” the public was never informed about. Groundwater mapping for Simcoe County is thoroughly noted (pgs. 295-306) and includes data from Lake Huron to Georgian Bay, Lake Simcoe, the Nottawasaga River, Newmarket Till and Oak Ridges Moraine. It is further identified as one of the most significant glacial aquifers, responsible for drinking water obtained from the Great Lakes and every connecting path from Canada to Chicago, Illinois. November 2012: At the same time Ontario promoted shale extraction, Premier Dalton McGuinty informed the media there was no reason to worry about fracking in the province. He offered this reassurance despite public objection to Dundee Energy and Mooncor buying land for the same purpose. This message was supported by the Ministry of Natural Resources when they confirmed one new shale well was drilled, but denied any knowledge of plans to continue. All political parties responded as if the premise of fracking was hypothetical, but each shared a connection to this series of concrete developments. The Liberal government spent millions to encourage fracking extraction and accepted millions from interested companies. Elected Conservatives spoke at fracking events and/or occupied an executive table with the most aggressive corporation. The NDP also enjoys considerable input from the labour movement, as business partners with an oil giant involved in testing the area. December 2012: The federal government passes controversial legislation to de-monitor Canada’s water and reduce environmental assessments, in favour of oil lobbyist demands. June 2013: Dundee Energy plans to invest $13.2 million in new Ontario wells and exploration to increase production. Another $2 million will be spent to map 314 kilometers of prospective shale opportunities. The corporation pays an extra $270,000 to the Ministry of Natural Resources in anticipation of future abandonment costs (pgs. 8, 28). This expansion is again reported to offset losses incurred by the American market and complication from the petro dollar (pgs. 10-13). September 2013: Dundee’s rig is used in Lambton County, Ontario to fracture-stimulate a new well. Additional projects are planned for summer the next year. October 2013: The Ontario Petroleum Institute holds an annual conference. This time it’s at the Windsor casino and sponsors are dwindling as companies are bought up, but Dundee Energy has attained the gold level. Seminars are provided by the Ministry of Natural Resources and Dundee itself, regarding radial jet drilling and its benefits to the fracking industry. This talk was followed by a presentation regarding the Blue Mountain shale formation and the majority of that day was dedicated to hydraulic fracturing topics. The smaller event was then closed by the Ontario Minister of Rural Affairs. It should be noted that a few days earlier, First Nations made international news with a government standoff against fracking. A Chief close to Bruce Power was also protesting the nuclear waste dump. In other curious developments, the Ontario Ministry of Natural Resources defers to the oil industry as its spokesperson. Visiting the government internet page to learn about provincial resources not only misinforms about Ontario’s history (forgetting Collingwood as the first producer), but it also directs readers to the “Discovery Education Centre” as the government’s source for facts. It just so happens the Discovery Education Centre is owned by Discovery Drilling Funds. They were purchased by LongBow Energy Corp and this business is steeped in the Alberta oil sands. Head office is located in Calgary, Alberta and one of the key executives is a former Koch Petroleum manager (of Koch Industries fame). It’s unclear why a private group of five western oil companies is now speaking for the Government of Ontario. Regarding competition between fracking and nuclear waste, the town of Walkerton, Ontario is located at the midpoint between them. Driving half an hour west, residents will arrive at Bruce Power and driving half an hour east, they’ll arrive at the heavily promoted Collingwood oil deposits. If they dare to drive south, they’ll arrive at Sarnia’s petrochemical industry and advanced plans for fracking in Lambton County as well. This tiny hamlet was foisted to world news when the water supply was contaminated and more than 2,300 residents became severely ill. Several died. Criminal charges were laid. The Conservative government of the day was blamed for legislation that privatized the testing of water safety. Now the same families may serve as a test, to see what happens when government policy allows fracking beside nuclear waste, fourteen years later in a repeat performance. Everyone who obtains drinking water associated with the Great Lakes will also be affected, if any part of this experiment goes wrong. And despite Ontario denying plans to frack, taxpayers footed the bill to produce widespread tests for shale oil, in addition to yearly seminars designed to entice extraction. These water tables come from one of the most important Precambrian aquifers. It supplies the local area and stretches deep into the United States. This underground water highway also supports Toronto and all the towns branching out along the way. The only thing that doesn’t appear to support 40 million North Americans, is politics north of the border and its friends in the energy industry. If all bureaucracies have skin in the game, who’s left to speak for the water? Yellow patch indicates the proposed nuclear waste repository. Black and white circles represent boreholes testing for gas and oil. Red stars were added to identify from left to right: Kincardine (nuclear waste), Walkerton (water tragedy), Collingwood (shale oil) and Wasaga Beach (oil testing plus dead fish/birds). Map courtesy of the MNR. Feather shape indicates the nuclear waste repository – a closeup view of Bruce Power property. 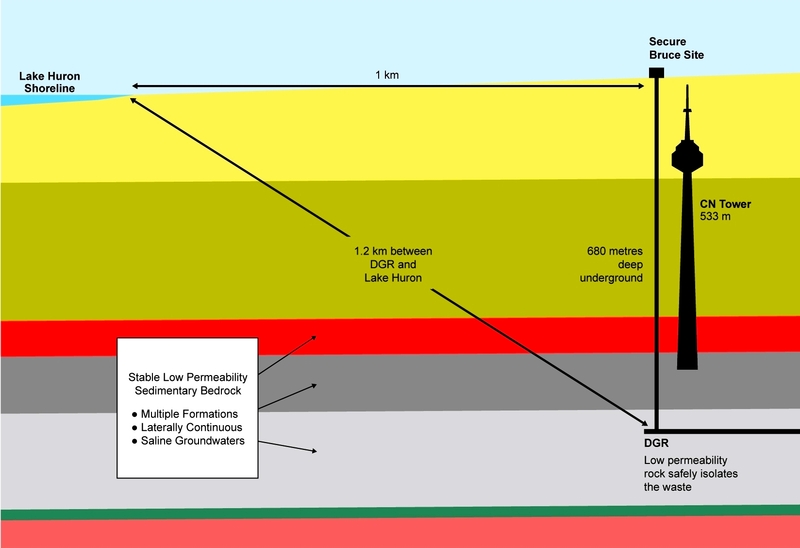 Depth of the proposed nuclear waste site is approximately equal to the depth of shale oil deposits.